"When I grow up, I want to be a farmer." For as long as Sally Myers can remember, farming has been her dream. So in 2004, at the age of 50—after seeing her last child graduate, ending a 20-year marriage, and selling her optical shop—she moved from Kodiak Island, Alaska, to Hawaii in search of warmth, some personal healing, and a piece of fertile farmland. 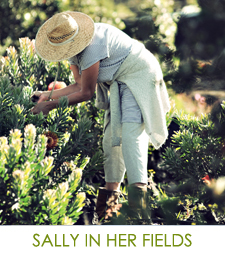 Shortly after arriving, Sally went to work in a local farmer's Plumeria fields for room and board so that she could explore the island and develop a plan for her "project." That's where she met tropical fisherman Jay Lovell, an island citizen for over thirty years, who also rented a unit there. "Jay was a true friend, and he became my best friend." 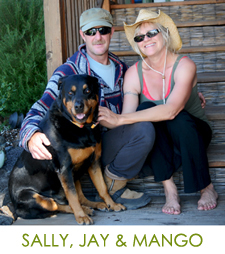 Absolutely Protea was conceived out of Sally and Jay's mutual love for Protea and their passion for each other. 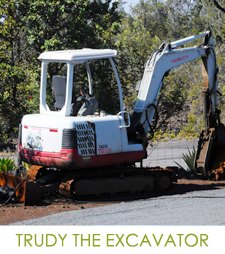 Together, they dug more than 2,000 holes (with help from Trudy the Excavator), filled them with cinder soil, and planted "keiki" (baby) Protea. Over the next five years, they watered...waited...built their own home from the ground up...watered some more...and waited some more...for the opportunity to start sharing their breathtakingly beautiful flowers with the rest of the world. While he was stationed in New Guinea during World War II, Sally's father Frank wrote many letters to her mother Betty about the wonder and splendor of the land and flowers. He would try to tell her how it felt to touch and "pet" the feather-like blooms and described them as "an explosion of color in the night sky." Sally's father passed away in 2002, but she is comforted and amused by the knowledge that she is now growing and sharing these amazing flowers that he so admired. Betty was able to live with Sally on Mauna Loa for a year before reuniting in spirit with her true love, "Frankie Boy." She had the opportunity to touch the flowers and watch them grow from her front window. When Sally works in her fields, she feels their blessing shining down upon her.